One of the things I was really looking forward to about going out of town for Christmas was getting to take the boys to visit Santa at Bass Pro Shops. 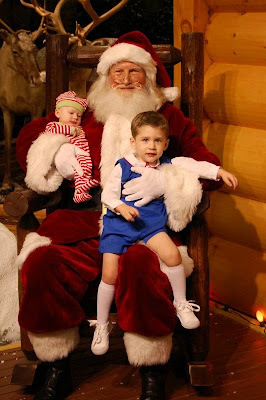 We don't have one near Waco but I absolutely *love* the Santa experience at Bass Pro Shops. It's peaceful, joyful and every year so far we have received a beautiful picture (for free, mind you)! There are alot of things that are disappointing about having to cancel our Christmas plans this year. 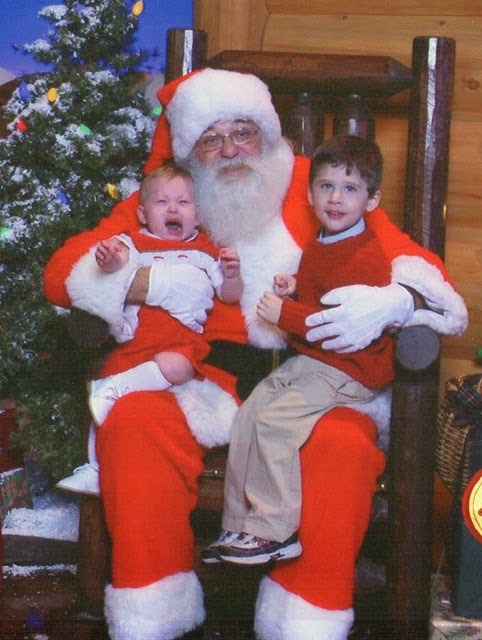 But, in an effort to make the best of our situation, I decided to take the boys to visit Santa at our local mall instead (big mistake!). 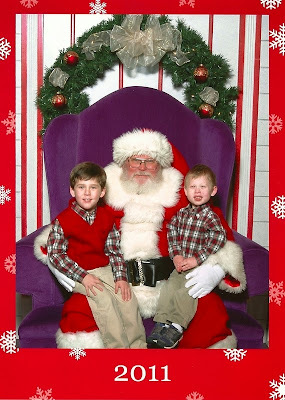 Santa with missing teeth...a very grumpy sales lady...annoying rules that prevented us from videotaping their Santa experience...a ridiculous price for a picture that did not capture my boys best smiles. In an effort not to show my disappointment and effectively ruin the boys' Santa experience, Brian and I just graciously smiled while giving over our $21 for a picture we didn't really want. Fortunately, the boys enjoyed meeting the very sweet Santa. (Oliver didn't notice Santa was missing most of his teeth). Oliver spent time telling Santa about tornadoes. Bennett enjoyed waving to Santa and bravely crawled in his lap once big brother showed him how to confidently do it. So, this probably won't go down as my favorite family Christmas ever. But, I think the boys won't know much different. And the best thing is, there is always next year! Aw, I think it's cute! Glad Oliver was able to coax Bennett in! It turned out good, at least they are all happy!